The race for the Kano Government House remained too close to call last night as the collation of results of the makeup election in 28 local government areas of the state got underway in Kano. 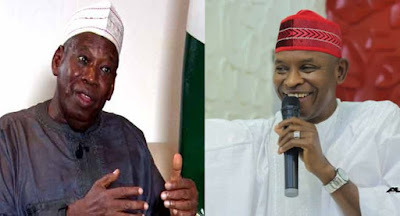 Governor Abdullahi Ganduje of the All Progressives Congress (APC) was ahead of Abba Kabir Yusuf of Peoples Democratic Party (PDP) in the results already declared before the Independent National Electoral Commission (INEC) took a break at about one o’clock this morning. Governor Simon Lalong of Plateau has been declared winner. Governor Samuel Ortom of Benue and PDP’s flag bearer in Bauchi State, Bala Mohammed are coasting home to victory. The Kano exercise is scheduled to resume at 8am today. The contest in Sokoto State was similarly tight between Governor Aminu Tambuwal of PDP and Alhaji Ahmad Aliyu Sokoto of the APC last night with the challenger seeking to erase the 3,443 vote advantage of the incumbent. As at two weeks ago when INEC declared the March 9 election in Kano inconclusive, Abba Kabir Yusuf of the PDP was leading with 1,014,474 votes while Ganduje had 98,7810 votes. Ganduje had narrowed the gap substantially at the end of voting yesterday. Moments after the commencement of voting in Kano yesterday, the PDP acting chairman in the state, Rabiu Sulaiman-Bichi, called for the cancellation of the exercise across the 28 local government areas of the state, alleging that thugs had taken over the process. 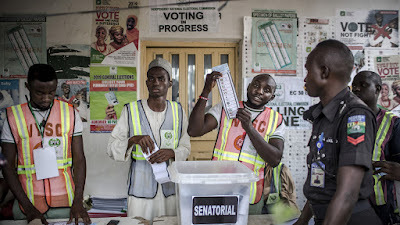 “Today this charade called re-run election was slated to hold in Kano and other states but unfortunately, what we have in Kano is nothing but a sham,” Sulaiman-Bichi told reporters. “Reports reaching us since yesterday (Friday) indicated that thugs have allegedly been mobilised to take over all the 208 polling units,” he added. The thugs, according to him, were brought from Zamfara, Katsina, Kaduna, Plateau and other neighbouring states and were ‘armed to the teeth’ posing as voters in the polling units in the localities. The chairman alleged that the thugs freely voted with PVCs that did not belong to them, while some posed as INEC staff. Soon afterwards, the PDP national publicity secretary, Mr. Kola Ologbondiyan joined in calling for the cancellation of the polls citing alleged disruption of voting and bloodletting by APC agents. All material facts on the supplementary election, Ologbondiyan claimed, showed that thugs violently took over polling units, attacked and chased away voters and engaged in massive thumb-printing and ballot stuffing for the APC. He also alleged that the police arrested the Commissioner for Special Duties, Muktar Yakasai alongside APC thugs while disrupting election in Yelwa in Dala Local Government area of the State. He said:”also, INEC is already aware of how APC thugs attacked voters in polling units in Gama area of Kano state during which four PDP members were feared killed and many more injured before they carted away ballot boxes for stuffing for the APC. “The PDP invites Nigerians to note that our party grew democracy for 16 years without watering the quest for power with the blood of the innocent as the APC has done in the 2019 general election. The PDP leader in the State, Senator Rabiu Kwankwaso hurriedly called his own press conference to complain about the election. Kwankwaso who is the immediate past governor of the state and father-in-law of the PDP governorship candidate asked INEC to conduct a fresh rerun election in the state. He said there was no election yesterday as far as he knew. He said: “It is very sad that elections could not hold today because, by yesterday (Friday) evening, all the polling units in the rerun areas were overtaken by thugs. Very early morning today, elections were concluded in many polling centres. However, Police Deputy Inspector General Anthony Ogbizi Michael debunked social media reports of killings in Gama ward in Nasarawa Local Government Area of Kano during the supplementary election. “There was no such incident or arrest of some people in the any part of the state because the security arrangement was in order,” he said at a press briefing. He also said the police arrested 10 people for various electoral offences during the supplementary election. The suspects, according to him were arrested at various polling units where the elections were held. His words: “we made some arrest at the early hours of this morning. I may not be able to give the exact number of the people arrested. I cannot tell you whether they are black or white in terms of identity; but I can tell you that some human beings were arrested and they are detained, being interrogated. DIG Ogbizi also affirmed that there was adequate security arrangement across the state during the exercise, adding that, “I think to me, the security arrangement was quite in order. We did not witness any ugly incident, except minor and isolated incidences which were quickly addressed. Voting went on in all the polling units. He dismissed allegation by the PDP that the police compromised during the election, pointing out that, “one, if thugs had occupied any polling unit, certainly, INEC would not have been comfortable to bring out their materials to conduct the voting process. “Voters that went to vote would not have been able to vote. Again, you know it is secret ballot, so we do not know which party or candidate the voters are voting for. “The results have not come yet. Police is never involved in the conduct of the election, we are involved in providing security for the smooth conduct of the election. So, to accuse the police wrongly, I think it is unfair. “We should refute that report on social media that some people were killed in Kano. Was the name of anybody killed mentioned? Where are the witnesses? If there are not, then what are you saying.